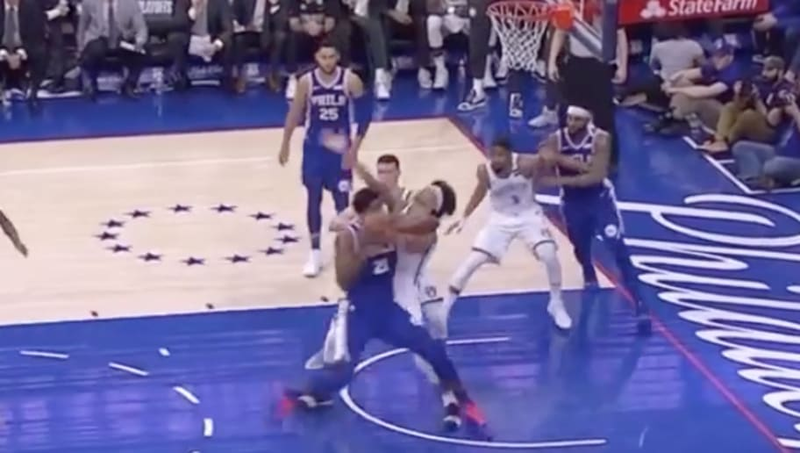 ​​Joel Embiid got caught swinging his elbows, but this could've been much worse. Heck, if his name weren't 'Joel Embiid', he very well could've been thrown out of this critical Game 2 between the Brooklyn Nets and Philadelphia 76ers. With Embiid driving down the lane, Allen played straight-up defense on the All-Star big man. The former Kansas star then threw one nasty elbow into Allen's face, making direct contact with his jaw. Ouch. Are we really comfortable calling that a flagrant-1 and moving on? Allen fell to the ground and he's certainly not one to flop. Known as ​one of the best defensive bigs in the Eastern Conference, the former Nets first-round pick had no reason to go down easy. Yet, Embiid's elbow plastered Allen with enough force to send him spiraling to the floor. Surely, we don't want officials to decide games for the NBA's best, but expect Nets fans to clamor for more punishment against the Philly big man.